From the beginning, East Tennessee State University has placed great emphasis on creating a football program that would give their studentathletes training unlike any other for sportsmanship, leadership, and academic excellence. During its 80 years, the football program grew from barely fielding enough able-bodied students to going undefeated and winning its first bowl game. Although the program was discontinued after the 2003 season, there is a renewed commitment by the university to restore the program and its strong traditions with the help of the community and groups like the Buc Football and Friends Foundation. 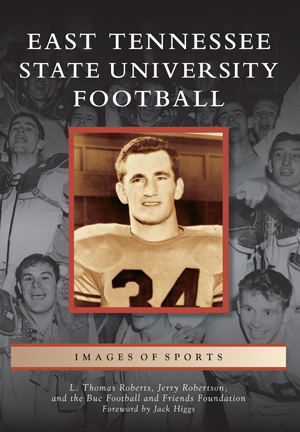 L. Thomas Roberts and Jerry Robertson have teamed up to produce the first published history of ETSU football to memorialize 80 years of play and honor all of those who made it possible. Roberts's grandfather and father both coached at ETSU, and he grew up on the campus attending Buccaneer sporting events. Robertson spent 38 award-winning years as the head athletic trainer for the Bucs. During his tenure, he was recognized as one of the most innovative and well-respected trainers in the country.